Interested in creating your own plugin for WordPress from scratch? Coding your own plugin if you haven’t done it before may feel like you’re venturing into no man’s land, especially if you’re not super confident about your PHP skills. The challenge is knowing how to get started – and being open to making mistakes along the way. Plugins allow you to add all kinds of functionality to WordPress, from adding a simple contact form to a page to beefing up your security and adding eCommerce capabilities. If you can dream it up, there’s probably a plugin that can do it – or an idea for a plugin you can build yourself. This is the final post in our five-part series for beginners, teaching you the fundamental concepts of WordPress development so you can take the leap from tinkerer to developer. By the end of the series, you should be able to create your own rudimentary themes and plugins, and flesh them out with your own features. In this tutorial, you’ll learn how to code your own plugin so you can modify the functionality of your WordPress site, third party plugins and even themes. Before we get stuck into making an actual plugin, let’s take a detailed look at hooks, actions and filters. It’s these elements that the whole plugin system is based on and will help you fully understand the behind the scenes of how WordPress actually works. What if you wanted to create a plugin that added some analytics tracking code to your site? Tracking code is typically placed at the bottom of a webpage right before the closing <body> tag. It must remain in place if the theme is switched and it must work on any WordPress install. So, if you don’t have control over themes directly, how do you do this? 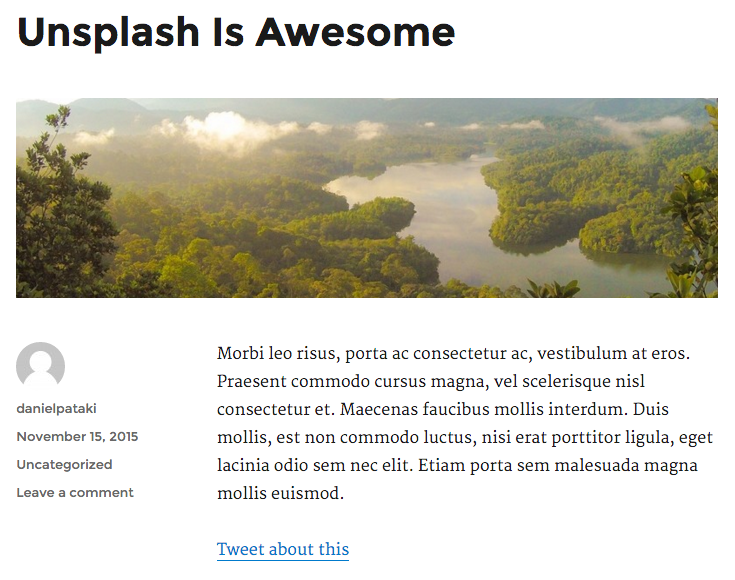 Remember back in WordPress Development for Beginners: Building Themes I mentioned the wp_head() and wp_footer() functions and how you must add these to your theme? Our example above is exactly why these must be present. The wp_footer() function can execute other functions defined by plugins. Let’s break it all down. Firstly, I wrote a function that simply echoes the tracking code. It isn’t used anywhere, it’s just a function sitting there in my plugin. Then, using the add_action() function, I told WordPress when to execute my function. Whenever WordPress gets to the wp_header() function it finds all other functions, which are hooked to it using add_action(). It then executes these functions one-by-one, echoing the tracking code as a result. This is the basis of hooks but we’ll delve into them in a bit more depth later in this tutorial so you can learn about and use their power. Before moving on, I want to mention a slight correction. The wp_footer() function in the footer of themes is not actually a hook, it’s a simple function that contains the hook somewhere within its code. A hook is called like this: do_action('wp_footer'), but this really wasn’t important for the first example, you’ll understand more about this soon! Now that you’ve had a taste of what’s to come, let me properly explain the terminology you’ll read about in this tutorial before we move on. Hooks are a part of the WordPress Plugin API. Actions and filters are two different types of hooks. Actions allow you to add functionality, you basically define a function that is run whenever the hook is processed by WordPress. A filter works similarly, but instead of adding functionality, it modifies existing functionality. For example, WordPress has a hook which determines the length of the excerpt: 55 words. You can use a filter to modify it to different word count. We’ve already looked at the first two, which are the only required ones. They identify which function should be executed and where it should be run. The third parameter determines the order of the functions that are executed. This is useful when there are multiple functions tied to the same hook. It’s entirely possible that you want to add multiple tracking codes to a website. Using the priority argument you can control when your function is run. The accepted arguments simply tells WordPress how many arguments the hooked function accepts. You’ll need to look in the WordPress Codex for each hook to see if you need to add something here. Some functions take more than one argument, in which case you’ll need to specify it here. Take a look at the example below and you’ll see why this is the way it is when creating our own hooks a bit later. WordPress doesn’t just offer actions in themes but also in the backend admin and within the context of specific user actions. The publish_post hook is run whenever a post is published, allowing you do something at that point. The need for arguments becomes apparent here. If I add a function to this hook, how do I know which post was published and what the details were? Looking at the hook documentation, you can see that the function is passed the post ID and post data as two arguments. As I mentioned earlier, filters work in much the same way but modify data so you’ll mostly be returning within your hooked functions. To add filters we use the add_filter() function, which takes the same arguments as add_action(). Note that I have not specified the priority and the accepted arguments. This will make the priority 10 and the accepted args 1. I’m not using the argument passed (the default more text) at all, I’m just returning a string. With a little CSS to float the ad to the right, you could have a standard ad block within your content in a just few seconds. You’ve essentially hard-coded that you want to show 10 products. What if someone is creating an extension for your work and wants a view where only three products are shown? If you write your code cleverly, you can allow others to modify it. Let’s use a hook to allow developers to tap into our work. Now that we know all about hooks we need to know where to put them. Let’s take a step back and look at plugins in general. Plugins reside in the main plugins directory of your WordPress site, which is usually found in wp-content/plugins. As an example, let’s create a plugin that adds a tweet link below posts. This information is displayed in the backend admin of your site in the plugins section. Once you save the file you should see your new plugin listed; you’ve just created a perfectly functioning plugin. It doesn’t do anything just yet, but it can be activated. Go ahead and do that now. This will add a link after our content, which will allow users to tweet and the link will already be filled in the tweet box. That’s actually all there is to know about plugin creation. All plugins are a mixture of functions and hooks that determine where these functions are executed. From now on, all you need to focus on is learning various sub-systems like the Options API, Metadata API and so on. There are many ways to add options to your themes. Let’s look at the default way that is contained in the WordPress Codex. While this may look cool and all, it’s overkill for our small plugin and just clutters the interface. Always consider placing your options pages inside an existing menu. This page would be best placed within the Settings section using the add_options_page() function. All done. The final step is to add a form that uses our options. Use the following code as a template to create your own settings. Don’t forget to use the settings_fields() and do_settings_sections() functions to ensure WordPress saves your data for you. At the end of the process you should see a new settings field which you can fill out and save. You can then use get_option( 'twitter_account' ) to retrieve the value anywhere within your plugin. We can then modify our tweet link to add “via @username” if the user has filled in their Twitter account name in the options. That concludes our series on WordPress development for beginners. In this article, we learned how to create a basic plugin and hopefully you feel psyched about making your own! As I mentioned back in part one of this series, I can’t stress enough how important it is not to be discouraged. Everyone has to start somewhere and no one is perfect. You will make mistakes along the way, struggled with understanding concepts, and get frustrated when code doesn’t work like it ought to. Just remember, determination separated the good coders from the bad. While this is the last post in this series, it doesn’t mean you should stop learning. I would encourage you to review the tutorials in this series, as well as the accompanying further reading that comes with each post, and continue experimenting with PHP and building on the theme and plugin you started building. It’s only through experimentation and persistence that developing for WordPress will get easier and you will graduate from tinkerer to developer.